﻿﻿﻿﻿﻿﻿﻿﻿﻿﻿﻿Give the gift of an amazing theater experience! 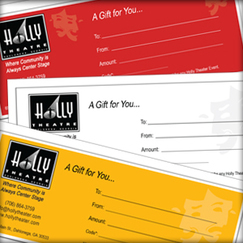 Our Holly Theater gift certificates are great gifts for all ages because there is something for everyone at the Holly. The recipients get to experience the magic of the theatre as they attend plays (both main stage and children's plays), concerts, and benefits of their choosing. What could be a better gift than an opportunity to spend time with friends and family at the theater? To purchase your gift certificate, give us a call at 706.530.5162.​! After you have purchased, please download one of our three certificate templates and write in the code given upon purchase to activate the gift certificate. Give the gift of entertainment courtesy of the Holly Theater!